BRIDGETOWN, Barbados – Half-centuries from John Campbell and WINDIES batsman Jermaine Blackwood drove Jamaica Scorpions to a seven-wicket victory over Leeward Islands Hurricanes and maintained their unbeaten record in the 2018-19 WINDIES Super50 Cup on Friday here. All but 29 of Campbell’s 81 off 73 balls were in boundaries and Blackwood hit four fours and two sixes in 65 not out off 64 balls, as the Scorpions clinched their fourth straight victory and collected their third bonus point in the Group “B” match. In the other Group “B” contest: Hosts Barbados Pride collected their first victory of the Tournament, when former WINDIES Under-19 World Cup winner Shamar Springer produced a tidy all-round performance to take them past the United States by three wickets. At the Three Ws Oval: Campbell and Blackwood allowed the Scorpions to make light work of a victory target of 197 with a stand of 73 for the second wicket. This followed Campbell’s dominance of an opening stand of 87 with Chadwick Walton inside the first 11 overs. When Campbell departed in the 23rd over, the Scorpions needed another 55 and Blackwood made sure they chased down the remaining runs with little trouble, though they lost Andre McCarthy in the 30th over. 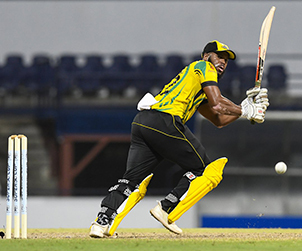 Earlier, Derval Green grabbed a career-best 4-44 from his allotted 10 overs – three of the batsmen bowled – as the Hurricanes, sent in to bat, were restricted to 214 for nine from their allocation of 50 overs. Devon Thomas played the clichéd captain’s innings, hitting three fours and two sixes in the top score of 71 from 99 balls, as the Hurricanes batting again failed to click with a handful of batsmen getting starts without carrying on and no significant partnerships. At Kensington Oval: Springer was the difference-maker in a low-scoring contest, following up his spell of 3-21 from 10 overs with 29 not out to take last season’s beaten finalists over the finish line for the first time. He snared the scalps of the American top-scorer Steven Taylor and fellow left-hander Alex Amsterdam in the space of eight balls to transform the complexion of the visitors’ innings, after the pair shared 94 for the second wicket to take their side to 98 for one in the 28th over. Taylor cracked seven fours and one six in 64 from 88 balls and Amsterdam supported with 32 from 78 balls. After their removal, there was little stability from rest of the batting, except Elmore Hutchinson, whose 36 from 31 balls, batting at eight, included two fours and three sixes, and the United States were held to 196 for nine from their allocation of 50 overs. When Springer came to the crease in the Pride chase, they were 133 for five and there was tension around. But he, fellow all-rounder Justin Greaves and Dominic Drakes, son of former Barbados and West Indies all-rounder Vasbert Drakes, inched the home team closer to the target and eased their team-mates’ nerves. Springer ended the match in grand style with 48 balls remaining, hitting consecutive fours – to wide long-on and lofted straight – off Taylor’s uncomplicated off-spin.